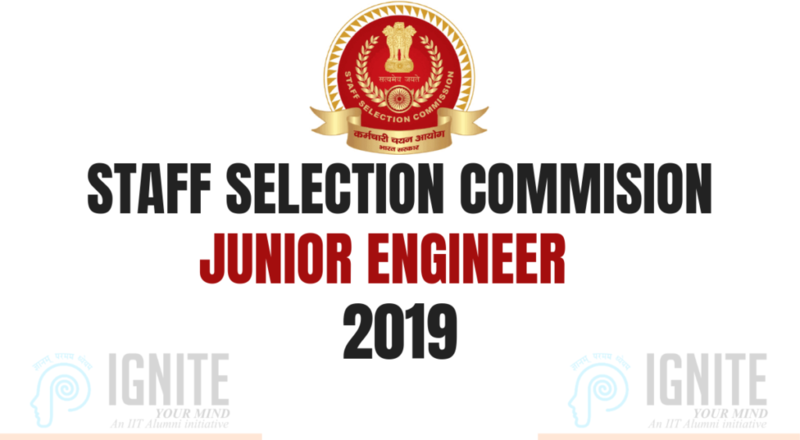 Staff selection commission, an organisation under government of India recruits various staffs for their various selected posts in Ministries and Departments of government of India and in subordinate offices. Candidates who are possess a degree in B.Tech/BE Civil engineering/ Electrical engineering/Mechanical engineering are eligible for this exam. Age limit for the exam is from 18-32 years with relaxation of the same for SC/ST and OBC. All the aspiring junior engineers who wish to be employed in Central Government agencies such as Central public works, Central public works can apply for the exam through online. Application window for the exam is from February 1, 2019 to February 25, 2019. The exam commences on September 23rd, 2019. The exam of SSC JE is divided into two: Tier I and Tier II. Tier I consists of objective questions from G.K, Reasoning,Engineering(Civil and structural, Mechanical/Electrical). Tier II is descriptive written exam. Both the tiers together is marked out of 500. The syllabus of SSC JE basically consists of 5 subjects of which General awareness covers General intelligence, Reasoning and Civil & Structural Engineering for Tier I. Civil & Structural engineering, Electrical and Mechanical engineering for Tier II. First subject to cover for the exam is the General Knowledge. Out of 500, 50 marks is for GK. Revise previous years question paper. Reasoning strategy is a simple exam and you don’t have stress yourself by going through various books . Opt for previous years question paper as this will help you understand the scoring, exam pattern. Individual attention is given to students who need special attention in difficult subjects. IGNITE provides excellent faculties for who are well versed in their subjects. Faculties who are qualified in SSC provide training for the students. Technical areas are covered by the NIT/IIT alumni. Engineer’s forum weekend batch begins from February 10,2019. IGNITE provides NATA coaching to aspiring students who wish to join for B.Arch courses in prestigious colleges. Lateral Entry test is one of the entrance exams written by diploma holders after which the candidate can get into second year of the engineering course. IGNITE provides quality coaching for LET. Apart from coaching provided for various exams, IGNITE provides tuition facilities for B.Tech students. For aspiring candidates who wish to pursue diploma in various subjects of their interest, IGNITE provides good tuition facilities for different diploma branches. Apart from other courses, IGNITE provides coaching for B.com and Bsc. All subjects related to these courses are given equal focus. Doing masters, especially M.tech can be a nightmare but with proper help it becomes easy task. IGNITE provides the most insightful learning of the course beyond the college classroom. Plus two exams are one of the toughest exams where the student needs to prove their mettle. IGNITE provides higher secondary tuitions for +2 students of CBSE/State boards. IEO or Industrial extension officer is gazetted government job who play major role in MSME’s. IGNITE provides extensive coaching for Industrial extension officer to make aspiring students to excel in their exams. Another Technical area of study where IGNITE gives focus is for Technical PSC coaching through which aspiring candidates can avail job in Governmental sector. Hence these are some of the other courses provided by IGNITE. With constant hard work and with expert help one can crack SSC JE the toughest exam. Previous Previous post: Looking for Scholarship? ?